We wanted to release at least a “rough-draft” of our fall-term class schedule in July (see below). Although the actual schedule and classes will still be very similar to what we have offered in the past, we will no longer have a division between “morning core classes” and “afternoon enrichment classes”. Based on the results of a few parent surveys and input from families over the past year, we will have a balance each day of different types of classes throughout the day (literacy, math, social studies, arts, languages, technology, etc.) in which any student can enroll. We have revised our class schedule to offer one and two-hour long classes for nearly every grade level from 8:30 am to 3:30 pm each day (Monday through Thursday). Parents will be able to enroll students for one class, multiple separate classes, a full day of classes, morning or afternoon blocks, or multiple full days of classes, as desired (not required). We will have a couple of family-room areas where parents can wait with younger siblings for one or two hours while students are in class. We are also hoping to offer supervised independent-study periods when students can work on self-directed projects, online classes or curriculum related to their home learning under the guidance of an educator. Please be aware that, although we wanted to get out at least a DRAFT schedule of classes out to families this week, we are still hiring new Guides and Community Educators and working out space requirements in the new building, so we appreciate your understanding as this schedule goes through at least a few more changes during the summer. In any case, there will be a lot of interesting fall term classes that will supplement and complement your students’ home learning. We hope to be able to stream some of the classes online and to begin offering some distance learning options starting in fall or winter term as well, so stay tuned! 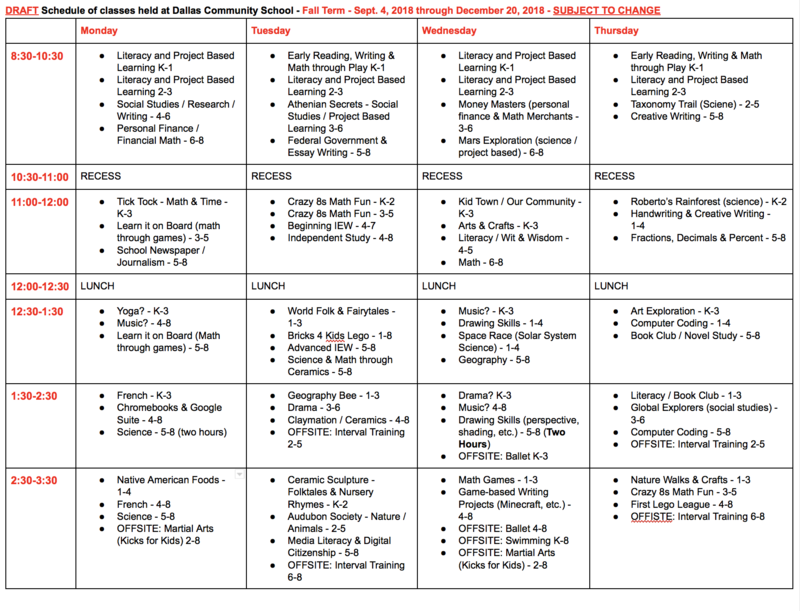 Our draft schedule lists the times, names (or subjects) and grade levels of each class. So for example, “Art – 3-6” will be for grades 3-6. As usual at DCS, grade levels are just recommended age levels, but we are flexible with the actual age levels for each class based on children’s actual ability levels and open to special requests from parents. We hope this draft schedule will at least give families a better idea of our plans and potential course offerings for fall term, 2018. Thank you for your participation in our parent surveys and for all of your ideas, feedback and understanding as we try to create a program that meets the needs of a very diverse population of families and the local and state educational regulations and requirements. We will continue to send updates on our program and facilities throughout the summer, and will have a final course schedule out no later than August 15. Meanwhile, have a great summer!